After Rio, I decided I wanted to take a break from triathlon training and have a little fun. So naturally, I signed up for a marathon because isn’t that what people do when they want to take a break and have fun? I ended up choosing Houston Marathon because a group of athletes from Catapult were doing it as well, and I thought it would be a great way to support their cause and be reunited with some of my friends from the Paratri world. When I learned that Houston typically averaged January temps in the 50s (pretty much ideal marathon weather) the deal was sealed. Though I continued working with Mark through the fall, I brought in Robyn – a coach in Chicago, the owner of EDGE, and a great friend – to do all my run programming. It was great to get another perspective in my training, and I loved being able to do a lot of my runs with her in person. She also offered to come to Houston to support me pre-race and pace me for part of the race. Houston ended up going though a bit of a heat spell the week of the race, and forecasts for that Sunday were showing a high around 70 and wicked humidity. I tried not to pay too much attention to the weather, and instead just enjoyed spending time with good people in a pre-race environment that was virtually free of stress (which like, never happens). I did an immediate double take, scanning backward to re-read that middle fragment. Surely he meant to say, “don’t let her beat you.” But when I read it a second time, I realized that Jerry’s use of pronouns was entirely intentional. What I did not realize, however, is just how much meaning those words would come to take on. The other great wisdom came from Robyn as we made our way to the start corral on Sunday morning. 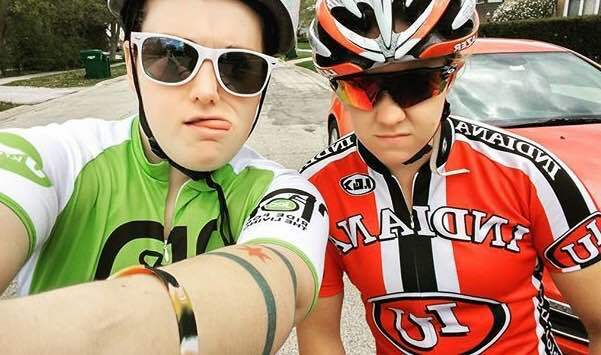 She told me how she loves racing for the same reason that some people love weddings — it’s a time when people show up as the best version of themselves. At weddings, you wear your nicest attire, you’re on your best behavior, and for that one day, you put your own stuff aside in order to celebrate two people’s love for one another. And it’s kind of the same on race day. You reserve your favorite shorts and most comfortable socks, you show up with freshly shaven legs and the best fuel in your body, and for that one day, you check all your insecurities at the door in order to celebrate your love for your sport. And so I started the race ready to be my best self and ready to face my toughest competitor, yours truly. I was excited to be there, confident in my preparations, and (in retrospect, perhaps naively) optimistic about the conditions. I had Stephanie, a Catapult volunteer and guide extraordinaire, at my side from the very start and looked forward to Robyn joining us a few miles in. It was 68 degrees with 100% humidity when the race began. Knowing this, we decided to start the race a fair bit slower than my goal pace, with the intent of getting faster as I went along. But I was feeling good and barely noticing the humidity, so I split the difference and settled in to a rhythm just slightly slower than goal pace – which at the time, felt pretty conservative. It was at mile 6 that I was supposed to start speeding up, but when I got to that point, the opposite started happening. As the numbers on my watch got larger instead of smaller, I started to notice how much I was sweating, how the socket of my prosthetic had already rubbed away the skin on my leg, how fast my heart was beating, how difficult it was to get air into my lungs. That was the moment when I realized just how hard my body had been working in those first few miles. By running at a slightly too aggressive pace, I had dug myself a hole; but because of the humidity, every shovelful was twice the size as it should have been. So by the time I got to 6, that hole was so deep that there was no coming out of it. And let me tell you: to feel that bad, that early on is one of the biggest mental challenges you can face. The next several miles were a pretty dark time. Robyn jumped in at 8, and instead of being excited for her company, I barely acknowledged her. The pain that I was feeling was all-consuming, and I felt almost zombie-like. I was trying so hard to stay within the mile that I was in, but all I could think about was how these early miles were not supposed to hurt this much. Then around the halfway point, I finally told Robyn the thought that had been going through my mind for the last 7 miles. I told her I felt like I was wasting my fitness. The message between the lines was that I wanted to stop. I wanted to pull off right there, call it a training day, and pick a new race in a few weeks — a race where I could actually achieve what I knew I was capable of. Those words really got to me. In that moment, I was not being the best version of myself. My best self does not dwell on discomfort so much that it debilitates her; she uses the discomfort as fuel to move forward. My best self doesn’t ignore the people around her or roll her eyes at signs of encouragement; she opens herself up to human connection. My best self does not spend a quarter of her race wishing she could quit and choose an easier one; she stays in the present moment, and does everything that she can in that moment to maximize her effort. I was allowing me to beat me. A version of myself that I don’t really like very much was beating the version of myself that had planned to show up that day. But I realized in that moment that my best self could still make an appearance. I just needed to do something differently. Empowered by this shift in my mindset, I knew I needed to make a physical change too. So I took off my hydration vest, then realizing how good I felt without it, I stripped my sopping wet shirt as well. Between the loss of weight from shedding the vest and the air that was getting on my skin, it felt like a flip switched. Suddenly my pace dropped what felt like minutes. My form tightened up. I began to notice the things around me again. I even started to laugh. I was back. For the rest of the race, I felt like a different person. Instead of being consumed by the suffering that I was experiencing, I was working with it. To be clear, I was still very much suffering; but it no longer felt like this indomitable force that clouded the entire experience. Instead, it became one sensation that I was experiencing in addition to a gamut of other feelings. Rather than allowing the pain to hold total power over my race, I acknowledged its existence while making space for feelings like strength, amusement, joy, and pride. There were some tough miles near the end, but for the most part, I took that second half stronger than the first. And when I finally crossed the finish line – a full 30 minutes after I originally planned – I was so full of pride. Because to be as low as I was, and then to turn it around…that is a really beautiful thing. Now I’d be lying if I said I’m happy with how things ended up. In reality, the days after the race were really hard. I was mad at myself for how I paced the first section, mad at the weather for messing up my plan, and mad that I probably wouldn’t have a chance to redeem myself in this distance for a long time. When you’ve worked so hard for something, it’s disappointing when the result doesn’t reflect the effort that you put in. But here’s the thing: outcomes aren’t everything. This was a difficult thing to remember, both in the middle of the race and in the days afterward. But the farther removed I get from the race, the more I’m accepting that it is, in fact, the process that matters. And the truth is that the 14-week process of preparing for the marathon was absolutely amazing. I challenged my fast-twitch dominant body in new ways. I sustained the most volume for the longest period of time than I ever have before. I ran 20 miles on a treadmill. I negative split a 22-miler outside. And through it all, I had so.much.fun. When all’s said and done, the hundreds of miles I ran in training matter much more than the 26 miles I ran on race day, and that incredible training is what I’ll take with me. But the most important lesson that the Houston Marathon taught me is that my toughest competitor is not another person — it’s myself. But no matter what feelings I may experience in a race, they only have as much power as I give them. I always have the choice to bring my best self, and when that choice is made, I reclaim all the power. I can change the rest of the race. I can hit rock bottom, and then somehow find what I need to turn it around. And that is what I’m choosing to take with me. She was referring to Rio, the ostensibly obvious answer. I mean, that’s what anyone who got to go to the Paralympics/Olympics would respond with, right? But when I think about the year that I had, the highlight was not actually Rio itself — it was the process of getting there. It was the lessons I learned, the people I shared it with, and the self growth that I achieved along the way. Moreover, it was learning how to embrace the process while it was happening. You know that old cliche: “It’s not about the destination, it’s about the journey.” While I’d seen this quote plastered on many a decorative wall art in the past, I never fully understood its validity until this year. I started 2016 with a very different mindset. At that time, I was obsessed with one thing — the goal of winning in Rio. Consequently, I was going into every workout with this giant (self-imposed) pressure to execute it perfectly. I was constantly comparing myself to other athletes, and was self-conscious about everything I was doing in my training. I had a chronic buzz of anxiety that was beginning to consume me. While I was still excited about the destination of Rio, I was not enjoying the journey. I’ve always believed that certain people come our lives during times that we need them the most, and that certainly proved to be true in 2016. When my focus was so narrow that all I could see was the destination, I had people enter my life who forced me to widen my view and embrace the journey. 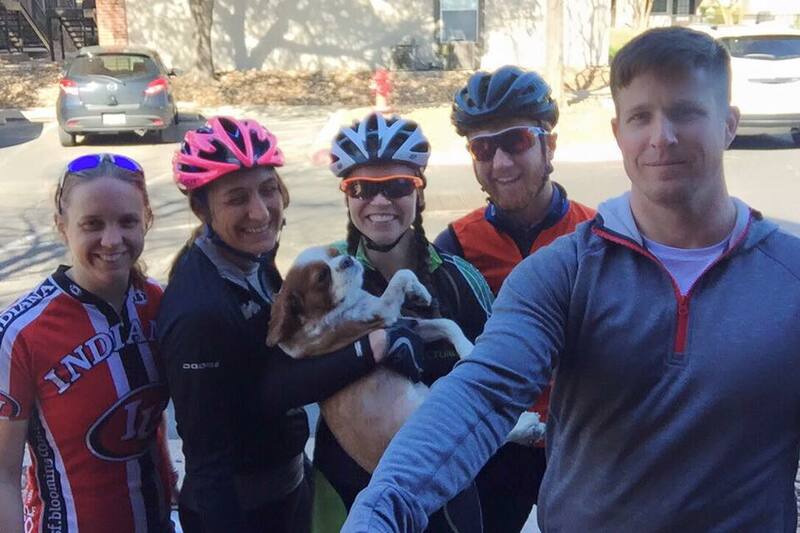 A few months into the new year, I started working with a new triathlon coach, Mark. A big part of our work together involved reframing my goals from being outcome-focused to process-driven. 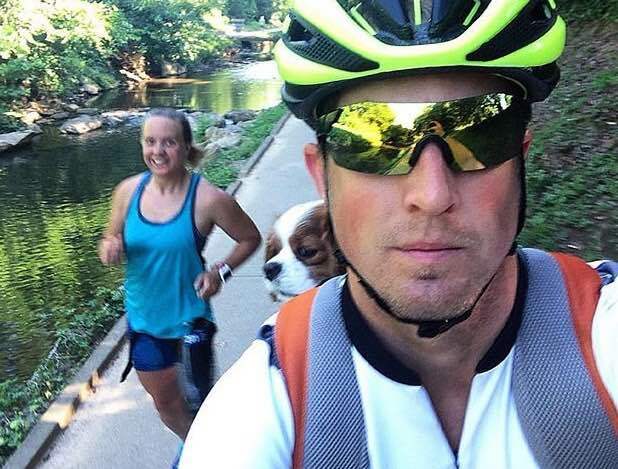 This meant that instead of worrying about hitting every pace exactly as it was written (outcome), I focused my attention on task-oriented skills, like maintaining a strong pull on my swim stroke or keeping a quick cadence on the run (process). Mark really emphasized that strong character is what drives results, so while part of his job involved writing my training sessions, the more significant part was in helping me develop as a person. I soon found that I was no longer obsessing over a race that was months in the future, but rather was directing my energy toward what I could do in that moment on that day to be the best that I could be. Then there was Sara, my sport psychologist, who I also started working with around this time. 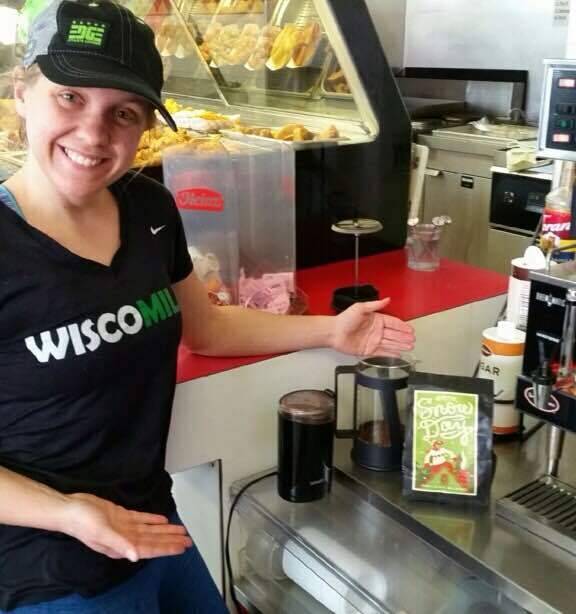 Sara introduced me to the principles of mindfulness, which tied in perfectly to my work in becoming process-oriented. By integrating mindfulness into my life, she helped me become more present in everything I did. Rather than dwelling on my thoughts, I learned how to accept them for what they were. Rather than fighting distressful emotions, I learned how to sit with them, embrace the discomfort that came with them, and eventually ride them out. Over time, I was able to limit the amount of time I spent distracted by my own self-judgements, and instead direct that energy towards being focused on the task at hand (i.e. the process). And all of that work in tolerating the more difficult emotions produced a pretty awesome side effect: it taught me how to embrace vulnerability and become a more authentic version of myself. Finally, there were my training partners and friends who reinvigorated my training by showing me that being part of a pack is a lot more fun than being a lone wolf. They more than anyone helped me find more joy in the process than I ever could have imagined (more on that here). All of these people played critical roles in helping me embrace the process of preparing for Rio, but at the end of the day, it was on me. I was the one who had to buy in to this seemingly ridiculous idea that it is the process that drives outcomes. And I’m not going to lie, it was really hard at first. When you’re wired to value outcomes over everything else, that shift in mindset takes a lot of work. But slowly over the course of the year, I started to see the benefits. After weeks of dedicating myself to the process, this sense of self-trust began to emerge. I developed this confidence that the decisions I was making were the right ones, and this belief that I had all the tools that I needed to perform. All of that work culminated in Rio. For me, the most memorable moment of the entire Rio experience was not crossing the finish line or standing on the podium — it was sitting on the start pontoon in the seconds before my race began. I remember looking out at the breathtaking mountains in front of me, invigorated by the cheering back at the shore, and just feeling go grateful. I was appreciative of the opportunity to be there, I was proud of the person that the journey had helped me become, and in that moment, I had never been more happy to race. My newfound self-trust lent itself to this sense of calmness that I had never experienced before. While I was ready to race my heart out, I knew deep down that it didn’t matter what happened on the course that day. I was beginning that race as the best version of myself that I had ever been, and that alone was worth more than any medal. Today, I can confidently say that 2016 was the best year of my life. The funny thing about that statement is that the “old” Hailey would have looked at the season that I had and said that it was a flop. I didn’t win a single race. I placed lower than I ever had in two of my four ITU races. And if you were really bold, you could say that I fell short of my goal by not getting that gold medal in Rio. But the Hailey today knows that the results of my races are not the things that matter. What matters is how I’ve learned to view my worth as more than my resume; how I’ve become more comfortable in my skin than I have ever been; how I’m continuing to become a person that I am truly proud of. And that, my friends, is a year well-lived. Who the hail is Hailey Danz? Don’t worry guys, it’s still me. I am – and always will be – Hailey Danisewicz. However, I have made the decision to shorten my last name for professional purposes. I realize that this statement may come as a bit of a surprise, but I am writing this so that I can be completely transparent about how and why I am moving forward with this change. Contrary to what you’re probably thinking, it’s not because I am trying to emulate my musical idol, Puff Daddy/P. Diddy/Diddy. But seriously, does anyone actually know what he’s going by these days? I was born with the kind of name that nobody knows how to pronounce. Despite people’s best efforts, my completely unphonetic, Polish last name never really comes out the way it’s supposed to (like in high school when the lady who called kids down to the office would call me Dana-sandwich). It’s a fact of life that I’ve always been accustomed to, but as my athletic career progressed, it became a growing frustration. I grew tired of the first question in every media interview being “did I say your name correctly?” I grew tired of race announcers struggling so much to utter my name that it would take away from the excitement of the moment they were trying to articulate. I grew tired of the internal battle of wondering if I should correct the presenters who introduced me inaccurately, or let it slide and have my audiences remember me by a false pronunciation. In these instances, the focus was on how these 10 letters happened to be strung together, when it should have been on the things that I was actually doing. I had reservations in making the change. For one thing, I didn’t want to dissociate myself from my family by going by a different surname. I brought them into the conversation as soon as I started to consider the change, but they understood my reasoning and supported it. Actually, the decision to go with “Danz” is one that we came to together. “Danz” has always been the nickname that our friends have used for our family, and to this day, it’s what we use to make dinner reservations to avoid excessive spelling over the phone. Because it was so important to me to keep the integrity of my real name, “Danz” was the natural choice. My other hesitation in shortening my name was that it felt sort of self-inflating — like a thing that only super famous people (e.g. Diddy) do, and I know that I’m definitely not super famous. I mean, I’m the girl who nearly ran away and hid when my regular cashier at Antique Taco told me that he saw me on the news. Needless to say, getting over this hesitation required a little more work. People have always told me that being an athlete is partially about your sport and partially about your brand. But for a long time, I was reluctant to buy in to that logic. I would get super uncomfortable using phrases like “marketing myself” and “developing my image.” It felt so pushy and pompous, and I didn’t have the confidence to believe that I deserved to talk about myself in that way. But my mindset changed when I returned home from Rio. I came home inspired by the extent to which other countries have embraced the Paralympic movement — how Paralympic athletes in these countries have become household names, on par with their Olympic counterparts. I realized that one of the ways we can gain that same traction in the United States is for us to, collectively, promote our Paralympians in the same way that we do our Olympians. If I wanted to do my part in growing the Paralympic movement, I needed to let go of my issues that were inhibiting my ability to self-promote, and begin to embrace the parts of my job that do not come naturally to me. I am finally beginning to accept that being a professional athlete is in fact a business. And the reality is, talking about a business that has a four-syllable name is a lot harder than talking about one with a one-syllable name. When I viewed it though this lens, the adoption of “Danz” was the savvy thing to do. And so, from this day forward, I will be going by Hailey Danz. It may take some getting used to (for both you and me), but I’m ready to embrace this shorter, simpler version and make some room on my tri kit. Also thinking less letters might just make me a little faster :). You know when you’ve gone a really long time without seeing a friend who once knew all the details of your life? You know that you should pick up the phone, but at the same time, there is so much that you need to catch each other up on, that the idea of covering that much information in a single meeting is too staggering. And so you put it off, and in the meantime accumulate even more life experiences that you’ll have to update said friend on when you eventually meet again. That’s kind of how I’ve been feeling about updating this blog. I’ve tried a few times to sit down and write over the last six months, but each time I did, I was overwhelmed by the amount of content I needed to cover. Not to mention how during the buildup to Rio, I was pretty caught up in my own process, and that process was very much a private affair. While I found a lot of value in journaling about my process, I was not in a place where I was ready to make those thoughts public. However, now that I’m a bit more removed from Rio, I’m ready to finally share with you what the journey was like — from the struggle of separating my identity from my sport, to the growth I achieved when I changed my perception of goals; from the anxiety that consumed me in the weeks leading in to the Games, to the quiet confidence that I found when it mattered most; from the pride that I felt walking into the Opening Ceremony, to the exhilaration of standing on the podium. All of this is to come in the next few blog posts…but what about right now? I’m sure that a few of you are curious about what life’s been like since Rio and where I’m going next. So here’s the quick version. If I’m to be completely honest, the months since the Paralympics have been kind of weird. When you have one thing that you’ve spent years focusing all your energy on, and then it’s over, it’s hard to figure out how you’re supposed to carry on. My life pre-Games thrived on focus, direction, structure; but all of that fell apart when the curtain closed on Rio. The last three months have largely been about picking up the pieces, and figuring out what this next chapter of my life is going to look like. I don’t have all the answers just yet, but I’m making progress, and that’s all I can ask for right now. 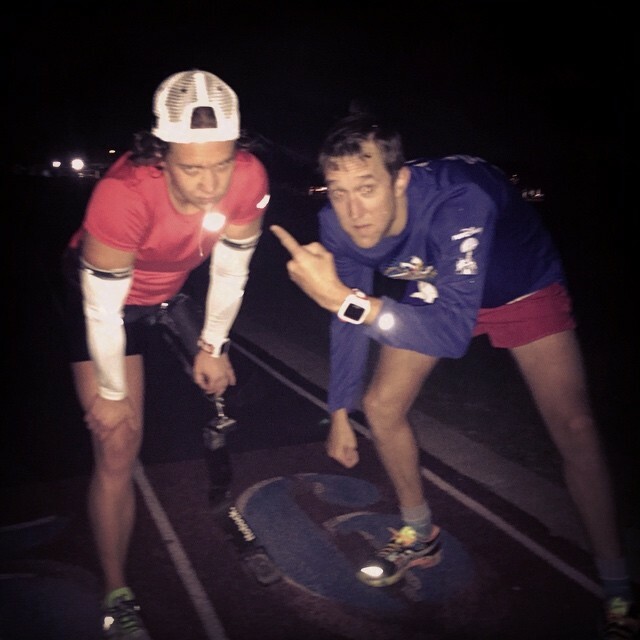 Shortly after Rio, I decided I needed a new goal, which led me to the Houston Marathon. I’m set to run my third marathon (my first in over two years) on January 15, and have had a ton of fun getting ready for it. The race have given me some semblance of normalcy by serving as something to work towards, while being different enough from my triathlon training that it feels like a much-needed mental break. After Houston, I’ll return to triathlon training in preparation for my season opener in March. I’m still living in Chicago and plan to stay here through the next year, with the exception of a two-month stint in Charlotte this winter. My current plan is to continue with triathlon for another quad, with the hopes of returning to the Paralympics in Tokyo in 2020. However, I also know that a lot can change in four years, so I am remaining open to whatever possibilities may come my way between now and then. The real point of this post, however, is to let you know that I am still here. And while it may take me a few posts to cover everything I want to say, I am committed to sharing it with all of you who have been so invested in my journey up until this point. Much like that eventual meeting that you finally have with the long-lost friend, I know I’ll find that the catchup is a lot easier (and more fun) than I built it up to be in my head. The hardest part is picking up the phone…and it looks like I just completed that step. The last time I wrote, I was about halfway through my winter migration in Austin. Well, that was back when my plan was to stay for two months; but about 6 weeks into my visit, a few of my friends began a campaign to get me to stay in Austin for one more month. Truthfully, it didn’t take much campaigning on their end. I was loving my time in Texas, was not overly thrilled about rushing home to the 30-degree temps in Chicago, and had nothing tying me down in either city. Knowing that I would not always have the luxury of being 25 and free, I spontaneously decided to stay the extra month. But it wasn’t just the peer pressure that convinced me to stay. I had achieved so much personal growth during my short time in Austin, and as I approached my planned departure date, I realized that I was not yet ready to stop growing. In the three months I was there, I became more of myself than I’ve ever been, and learned valuable lessons that I will carry with me for the rest of my life. Of all the lessons that I took away from my time in Austin, the most salient is what I learned about the value of surrounding myself with the right people. I had a breakthrough that completely changed how I approach my training, as well as my relationships in general. For the majority of my triathlon career, I considered (quite proudly, I should add) myself to be a lone wolf when it came to training. In my first season or two, I did do many of my workouts with other people; in fact, it was the community of people that I met that made me love the sport as much as I did. But as I started to take the sport more seriously, I found that training with a group made it hard to stick to the specifically prescribed workouts I got from my coach. I’d often conform to whatever pace the rest of the group was doing, and end up defeating the purpose of my training session. So I wrote off group training as something that wasn’t for me, adopting the mindset that the only way to the top was to go at it alone. But when I went to Austin, everything changed. There, I found a group of friends that challenged every preconceived notion I had about training with others. 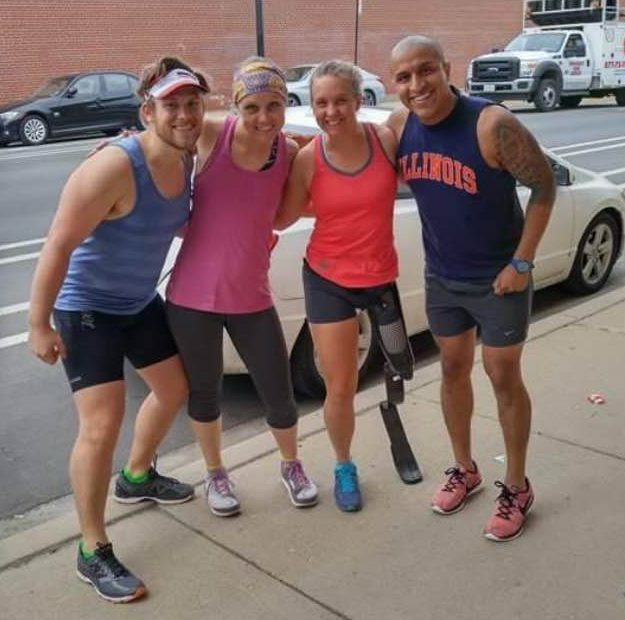 They were the first people I had ever met who said, “Yeah, I’ll do your workout with you…and I’ll do it at YOUR pace.” I didn’t know there were people out there who were okay with putting their own goals aside in order to help me achieve mine, but that is exactly what these friends did. They rearranged their schedules, meeting me for weekday rides in the middle of the day and Saturday track workouts at the crack of dawn. 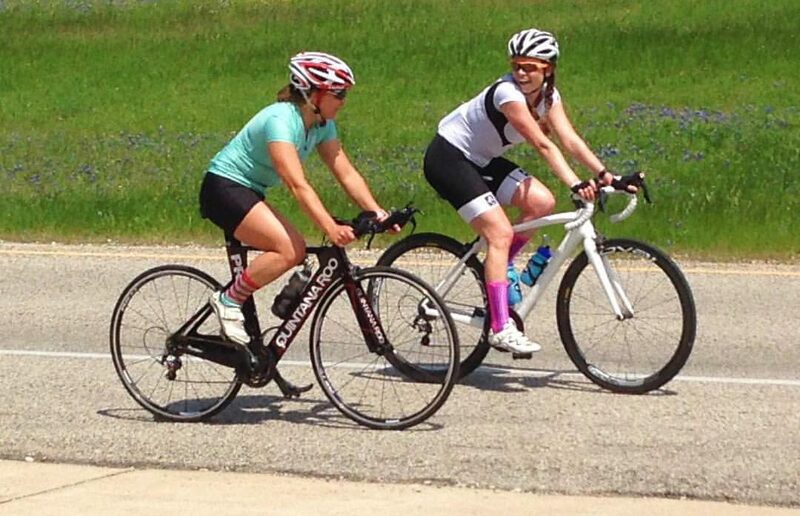 When I told them that I felt bad that they were riding slower than they would if they were on their own, they assured me that this workout wasn’t about them. Their selflessness and their commitment astounded me day after day, and it brought out the best in me in every workout. I didn’t fully realize it until I got to Austin, but in the months leading up to the move, I was in a pretty dark place. I had actually approached a point of apathy toward my training, a position I have never been in in my five years of competing. All of the fun had been sucked out of it, and it felt like I was just going through the motions. 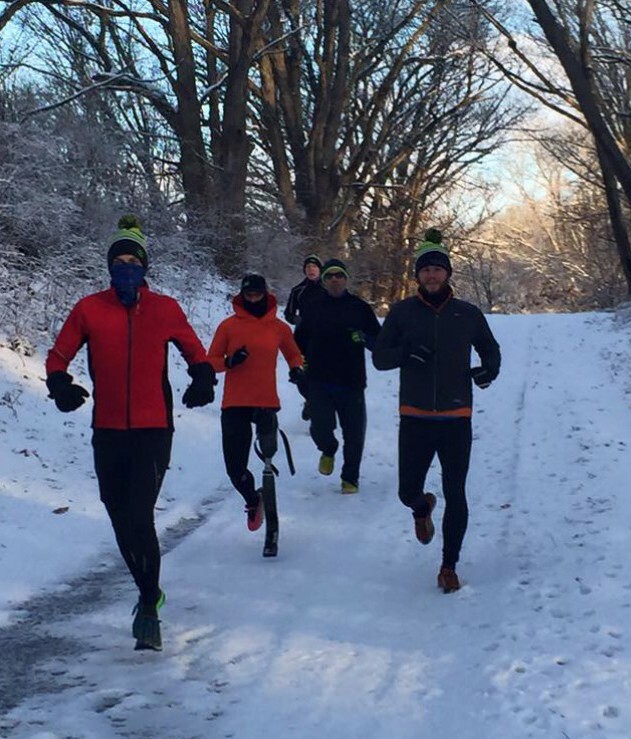 It wasn’t until I fell into this group of training partners that I realized that my apathy back in Chicago was coming from a place of loneliness. But my Austin friends changed that. These people made me look forward to workouts in a way that I never had before. They made hours pass by like minutes. They pushed me to paces that I didn’t think I could hit. They told me the exact words I needed to hear at the exact time that I needed it most. They made this foreign city feel like home. And most importantly, they took me out of the dark place that I was in, breathing new light into my training and into my life in general. When it came time for me to head back to Chicago in the middle of April, I found the transition surprisingly tough. Those first two weeks back were spent in a state of mild depression as I grieved the life that I had in Austin. I missed the sunny skies, the open water swimming, the great cycling roads; but most of all, I missed my friends. I had expected that coming back to Chicago would feel like coming home, but there was something about it that just didn’t feel right. I used to think that I would be a Chicagoan for life, but now I was wondering if the city was really the best place for me. And then I realized: I couldn’t change the gloomy spring weather of the Midwest, and I couldn’t make glorious cycling roads appear out of nowhere, but there was one thing I could control. I could create a community of training partners in Chicago like what I had in Austin. And I knew exactly where to start. For the last year or so, I’ve been a member at EDGE Athlete Lounge, (fondly known as my home away from home). EDGE is a training center/recovery lounge in Chicago that specializes in providing tools to speed up the post-workout recovery process, all in a cozy, welcoming space that feels like your friend’s living room. They also happen to attract some of the nicest athletes in the city, and have a thriving community of like-minded members that I love being around. One day I mentioned to Robyn, one of the owners, how I was hoping to find one or two training partners to help make the transition home a little easier. 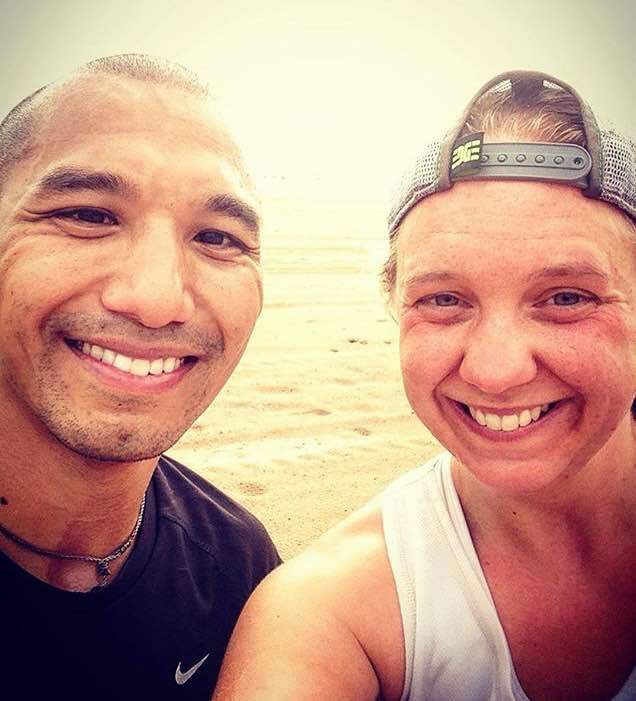 She assured me that I had a built-in network of eager training partners right there at EDGE, then posted in the members’ Facebook group stating that I was looking for running buddies to pace me on the track. Within minutes, there was an overwhelming response. I was shocked to see that there were so many people out there who, like my friends in Austin, were willing to spend their valuable training time doing my workouts. Since then, I’ve ended up forming my own little Chicago wolfpack just like the one I had in Austin. These days, almost all of my run workouts are done in the company of others, something I never thought would be the case just a few months ago. Almost a dozen EDGE athletes have stepped in to serve as rabbits in track workouts, motivators on tempo runs, and companions on recovery jogs. In the process, I’ve made new friends, strengthened bonds with old ones, and have found an entirely new level of joy in my training. And I don’t think it’s a coincidence that my run (which was the part of the race that I struggled with the most this winter) is now the strongest it’s ever been. 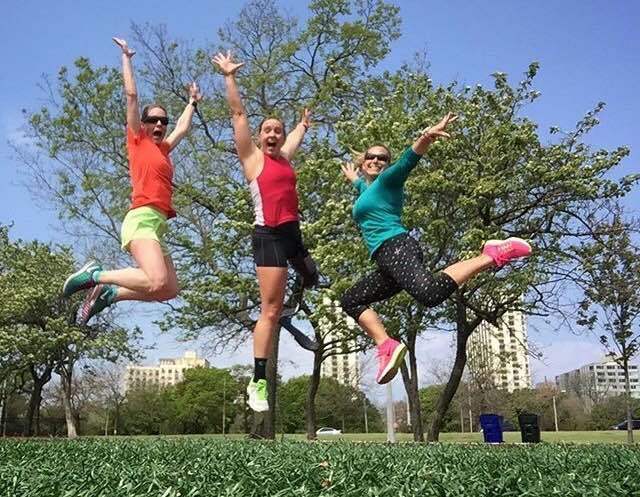 After about a week of running with these new training partners, something crazy happened. The city suddenly started to feel like home again. All of the doubts that I had about staying in Chicago disappeared, as I realized that – at least for right now – it really is the right place for me. Chicago may be missing the weather, the elevation, and the spaciousness that typically constitute the ideal training environment; but it does have some kickass people, and I think that counts for even more. This had once been a philosophy of mine, but somewhere along the line, I had lost sight of that wisdom. As my goals grew bigger and the stakes grew higher, I became so focused on my performance that I had become an island. But by self-isolating, I was also depriving myself of one of the things that makes sport so special: the athlete-athlete bond. That bond is a powerful force, and even in a sport as self-centered and individualistic as triathlon, it provides a dimension of fulfillment that you can’t find anywhere else. Nailing a workout on your own is an awesome feeling; but sharing that same experience with somebody else is even better. Crossing the finish line in Rio is sure to be one of the most memorable moments of my life; but it will be even more meaningful knowing that I’ll share that moment with every person who ever rode next to me on the bike or chased me around the track. 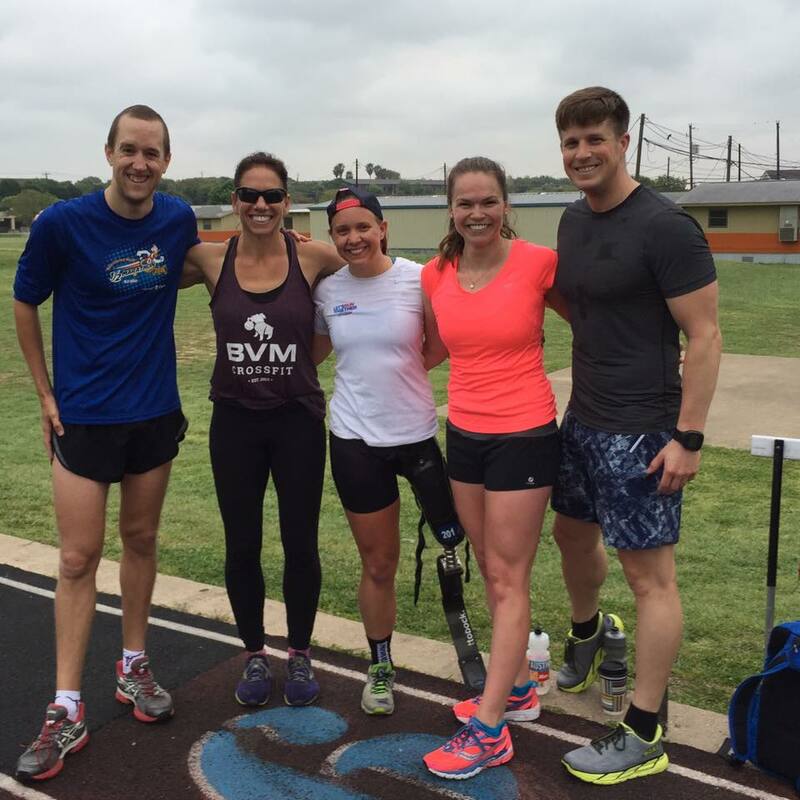 I am forever grateful to my training partners – in both Austin and Chicago – for reminding me that life truly is better with company, for showing me that home is where your people are, and for helping me grow into a completely new athlete. With “the big dance” in Rio just three months away, I am entering this final stretch of training with more confidence, passion, and joy than I ever have before. Not because I’m doing it as a lone wolf, but because I have an entire pack in my corner, making it happen. I never in a million years thought that I would become a Texan. Nothing against the Lone Star state; in all honesty, I really didn’t see myself leaving Chicago for at least another decade. And yet here I am, eating tacos for breakfast, blasting country music out of my car, and rocking a pair of running shorts whose Texas flag pattern screams “State Pride” so loudly that I would have mocked them a month ago. How did this happen? The short answer: sometimes the desire to be better drives people to do all sorts of things they never thought they would do. The long answer: well, keep reading. Last year, as my coach and I were discussing the upcoming offseason, she suggested that I relocate to a warmer climate so that I could continue training outside through the winter. Still traumatized by the misery that was Chiberia 2015, I started looking into other cities where I could spend the winter riding my bike outside instead of shoveling my car out of the street. Road trip coffee done right. After narrowing my list down to several cities whose weather was not soul-crushing, Austin quickly emerged as the frontrunner. 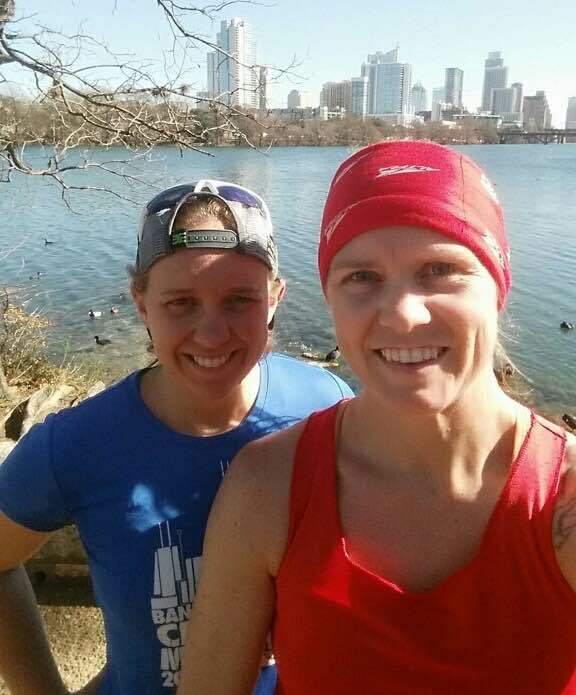 I had about a half dozen friends who lived in Austin, most of whom are also triathletes. Considering my biggest hesitation about moving was leaving behind my social support in Chicago, I was much more okay with going to a place where I already knew people. I decided that I would stick around Chicago through the holidays, then migrate down south after New Years, and stay though the end of March. Then in December my coach and I decided to go in different directions after two years of working together. The split was really hard on me, and in its aftermath, I was left seriously questioning if the move to Austin was still a good idea. I have never dealt with change particularly well, and moving across the country on top of changing coaches felt like more than I could handle. Many people close to me encouraged me to go anyway, assuring me that this would be an opportunity to get some valuable life experience. In the end, I decided to go not because I wanted to embark on a journey of personal growth, but because a. all my stuff was already in a storage unit and b. my sister had gotten me a gift card to a coffee shop in Austin, and I didn’t want it to go waste. Sadly, I am only 40% kidding here. So off I went on my “winter migration” (because I realized that you can’t really call a 10-week stint in another city a “move”). My friend Shawna was crazy kind enough to make the drive from Chicago to Austin with me. We decided to drive straight through–a decision that I DO NOT recommend–making the trip in 19 hours flat. Aside from stopping to fill the gas tank and empty our bladders, our only real detours were to obtain hot water for my french press (a necessity 10 hours into the trip) and a rotisserie chicken from Walmart (another obvious necessity). After a day of exploring the city together, I dropped Shawna off at the airport and returned to the apartment that would be my new home for the next two months. As I approached my front door, alone for the first time since I arrived, the reality of what I had just done hit me smack in the face and nearly knocked me off my feet. With the exception of going to college—which was a convenient 90-minute drive from the life that I knew—I had never just picked up my life and moved to a new place before. And now that I’d done it, I doubted that I was strong enough to survive it. As I sat in my empty apartment, clueless about my surroundings and uncertain about my immediate future, I don’t think I had ever felt so alone. Luckily, my pity party did not last long. I was far from being alone; I just needed to rely on a little help from my friends. And man, did they deliver. 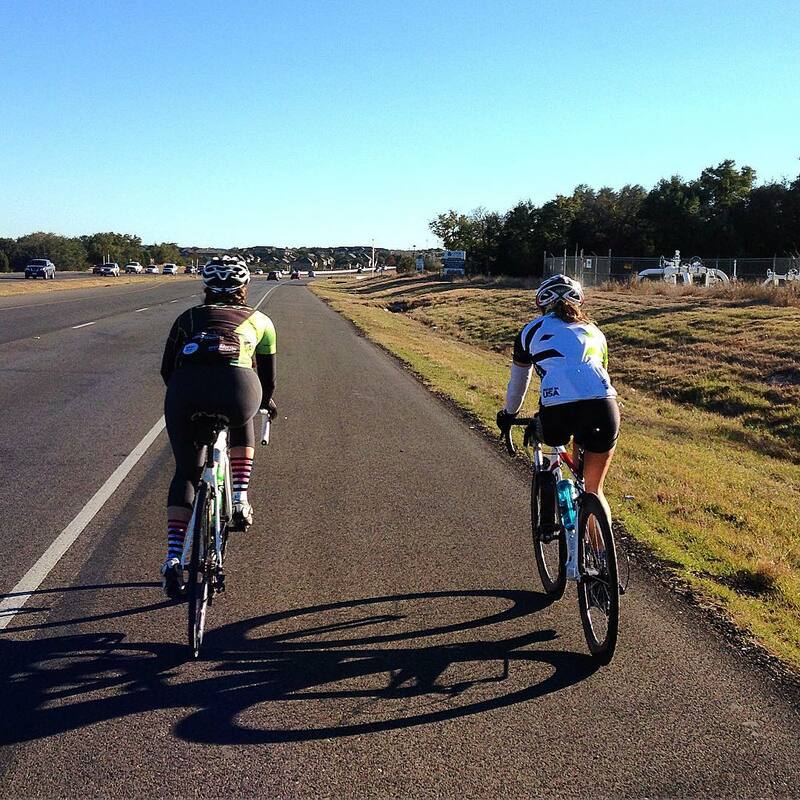 With their help, the next 24 hours included a home-cooked dinner, a group ride, introductions to new friends, and my initiation into the wonderful world of breakfast tacos. And within a week, I was shocked to realize that my social life was actually more active than it had been in Chicago. It’s only gone up from there, and these days, I am absolutely loving my time here. The weather has been nothing short of perfect — low 40s in the morning, rising to high-60s/low-70s by the afternoon — and has reminded me how a little Vitamin D and a tan can make you feel so much better about the world. Every week I am discovering new places to train, from challenging running trails to quarries for open water swimming. The cycling has been particularly awesome, and I have a growing repertoire of routes that are a hundred times better than anything I’ve ever found back home. I have training partners that join me for all of my key sessions, which has brought a whole new level of joy and fulfillment to my workouts, and has pushed me in a way that I’ve never been before. I’ve found some solid coffee spots that I frequent in between workouts, and am eating tacos on the daily (literally. every. single. day.). But best of all, I have an amazing group of people that have made this place feel like home. These people are the reason why I wake up each morning excited for the day ahead. And they are the reason why, as I sit here realizing that I’m just about halfway through my time here, I’m actually a little sad. I’m now thinking back to all of the people who told me that this would be a growing experience, and I’m astonished by how accurate they were. They say that in order to be successful, you need to take risks; to step outside your comfort zone; to do things that are scary. Going to Austin was easily one of the scariest things I’ve ever done. It may not seem like a big deal, but in my mind, I was basically turning my whole world upside-down at the most inopportune time. I was leaving behind everything I knew and everyone I loved 9 months before Rio on the off-chance that it would make me a little bit better. But I can honestly say that that risk that I was terrified to take is already paying off, and is doing so in ways I never could have foreseen. The training itself has been great and I can see the gains that I’m making; but the physical growth doesn’t even scratch the surface. The real growth has been in the mental strength that this experience is affording me. It’s the confidence I’m gaining from taking something that scared me to death, doing it anyway, and then making it work. It’s the empowerment in realizing that change is not something that I need to run away from, but something that can open doors to greater things. And it is these lessons—these developments in mental fortitude—that transcend the sport, and that I will carry with me long after I’m done competing. These lessons and also breakfast tacos. Seriously guys, those things are life-changing. Ah, the offseason. It’s a time to let the body recover from the previous months, to hit the restart button, and to enjoy being active without the rigors of in-season training. I always have big plans in the offseason — plans to make me a better athlete and a more well-rounded person. Plans like changing my swim stroke and learning to touch my toes and picking up French and reading up on worldly affairs. However, I can count on one hand the number of times I actually followed through with any of those plans. For years now, I’ve been saying that I wanted to start trail running in the offseason, but I never actually did anything to make that wish a reality. But shortly after my 2015 triathlon season ended, I learned that a group of runners from Edge Athlete Lounge (my training/recovery facility in Chicago) was beginning their season of trail running. I looked at is as a perfect excuse to give it a try, and went on my first trail run with Edge in late October. I quickly fell in love with the challenge of the different terrain, the serenity of being in the woods, and the company I got to share it with…so much so that it has since become a Sunday morning ritual. Each week, we meet at Edge before dawn, and pile into Brian’s Jeep Wagoneer like a 1970s family embarking on a road trip. From there we head out to Palos Hills, located just 30 minutes outside the city, but home to miles of forest preserves and a web of trails that makes it feels like an entirely different world. 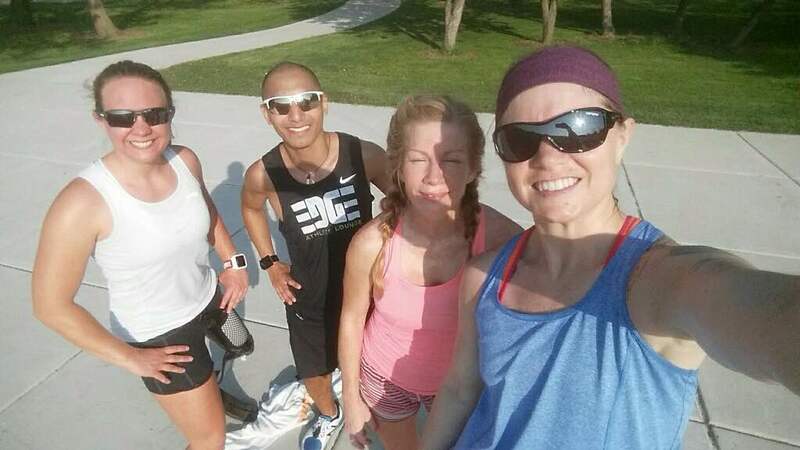 It’s a time to log fun miles, connect with nature, and share time with some seriously awesome people. And so, I started to research how I could make my blade winterproof. I found that the easiest and most effective way of getting traction on ice was by inserting standard sheet metal screws into the soles of your shoes. So that Saturday night, I got a pack of screws, drilled them into my blade and my right running shoe, and went to bed hoping that this crazy scheme would actually work. As the Wagoneer entered the forest preserve parking lot that Sunday morning and I saw the sheets of chunky ice that we would be dealing with, I had a brief moment where I questioned why I had even come (when your entire life is based on the fact that you have one leg that works really well, putting yourself in a position that puts that one leg in jeopardy is all the more scary). Those first few steps were nothing short of terrifying, but once I realized that those screws were actually going to support me, I dove right in. The conditions that day were seriously treacherous, but my legs handled it better than I ever could have hoped. I finished that run prouder than I’d been in a long time. Not because I had run very far or very fast, but because I had done something that I’d always thought was impossible. This last Sunday, our group hit the trails once again. It had snowed several inches over the course of the week, and the ruddy patches of ice that were there the previous Sunday were now covered by a layer of pristine powder. Within the first few minutes on the trail, I knew that this was going to be a run that I would not soon forget. I was finally feeling comfortable on the terrain, and for the first time, I was actually able to look up from my feet and take everything in. And man, was there a lot to take in. Like the fresh powder atop the trees that appeared as though they came straight out of a storybook. Like how the sun hit the snow and created a breathtaking glow on the landscape beneath it. Like how the only footprints in front of us were those of a coyote and a deer — the trail otherwise untouched by human life. I felt the cold bitter air as it filled my lungs; felt the hairs in my nostrils freeze as I inhaled the crispness. I was breathing at a rate that would have been perceived as difficult if I were on the road, but feeling so light and effortless in my movements that the challenge did not even cross my mind. As I tore through six inches of snow, I smiled wondering how in the world this was really happening. And as I threw myself down the descents, I couldn’t help but feel like a little kid. An 8-year old version of myself, bustling with energy, without a fear in the world, whose only concern was how I never wanted it to end. On the car ride back to the city, I found myself thinking about the last time I felt that way on a run. I could think of only two other occasions. The first was in a hallway at Scheck & Siress Prosthetics on a winter afternoon in 2011, when I broke into a run for the first time in eight years. The second was two years later, when I ran my first marathon in Chicago, a race so fun that I smiled for five hours straight. All three experiences shared a common feeling that I could not quite articulate until I was finally able to put my finger on it. It was pure, unadulterated joy. Joy, I have learned, is different from happiness. While happiness is a general state of being, joy is fleeting. It’s an emotion so raw and so rare, that many of us may not even remember what it feels like. Joy is a sensation so intense that you feel it in every ounce of your body. It’s that feeling of wanting to bust at the seams with elation. In a world that emphasizes that happiness is the only thing we need, joy is something that we rarely allow ourselves to experience. But why? Why is a concept so simple one that is so difficult to achieve? I think it has something to do with entering uncharted territory – with experiencing something that we never have before. This would explain why as kids, those moments of joy are so frequent. As adults who fall into life’s routine and rarely have the opportunity to experience something novel, joy is finding that novelty and allowing ourselves the time to cherish it. 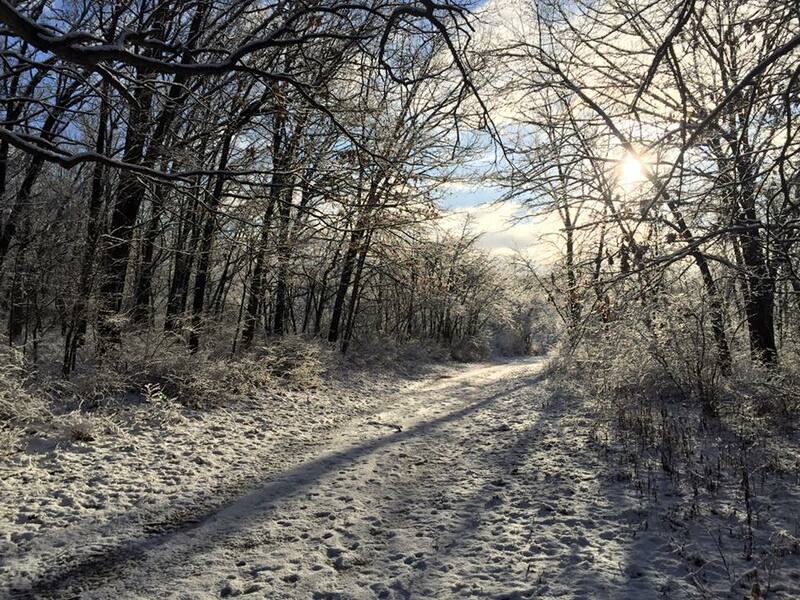 My first-ever run through a snow-covered forest was like a kid playing in snow for the first time. Laying down the footprints on a trail not yet touched by another human was like navigating the world through the adventurous eyes of a child. Or maybe it’s not so much doing something that we have never done before as it is doing something that we didn’t think we could do. Perhaps joy is what happens when we take something that scares the hell out of us, look it in the eye, and decide to pursue it anyway. It’s experiencing the feeling of flight after eight years of thinking that my feet would always be planted on the ground. It’s running 26.2 miles after thinking that I wasn’t even capable of running a quarter of that distance. It’s tearing down a snowy hill after a lifetime of thinking that winter running was synonymous with the treadmill. Perhaps joy is looking our fears in the face, overcoming them, and coming out feeling as though we have conquered the world. The last couple of months have been one of the most difficult periods in my athletic career so far. Without getting into the details, I’ll just say that my motivation — the one thing I have always had in abundance — was all but gone. Training has always been something that made me happy, but in those two months, it was something I dreaded. During that time, my Sunday morning trail runs were what gave me light. They were the one time of the week where I was enjoying what I was doing. They made me excited about training again. They made me reclaim the happiness I had lost. They made me fall in love with running all over again. And this Sunday, it culminated with gift I have only experienced a handful of times in my adult life — a nonstop hour’s worth of pure joy. As I head into the biggest year of my life thus far, I am sure there are going to be more difficult times ahead. Times where my motivation is missing, times were dread ensues, times where I question my love for the sport. But when those times come, I will remember that day on the trails, remember the joy that I felt, and remember why I do what I do. Those moments of joy, fleeting as they may be, are the moments we fight for, and the moments that make life worth living.